As soon as I graduated high school I was so excited to start decorating my future dorm room. I may have been a little too excited...good luck to whoever who has to deal with me decorating a house one day! But as a girl who has had the same bedroom decor since 7th grade, it was time for a change, and I seized the opportunity. 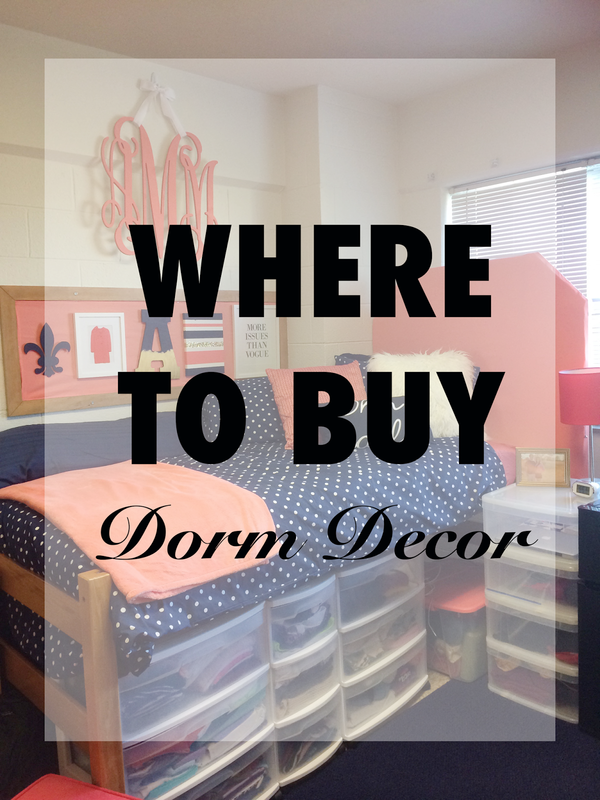 After scouring the internet and stores all summer long I found everything I wanted, and now I'm here to share with y'all some of the best places to find dorm decor along with some decor ideas! But first, here's some general tips! 1. Before you start shopping decide on a color palate and a basic idea of what you want so you don't buy more than you need. Also take into consideration how long you want the pieces to last you. I went with a navy, coral, white and gold color palate; I stayed neutral with the navy, white and gold that way if I got tired of the coral I could easily change up my color palate without having to start all over. This way the majority of my pieces will last me at least through college. 2. Don't forget about the discount stores. I know it can be easy to get caught up in the typical Bed, Bath & Beyond and Target, but also be sure to check out your local T.J. Maxx, Marshalls and HomeGoods. 3. Know when to DIY vs. when to buy. DIY is not always cheaper, but then again, sometimes it is! Price things out then decide from there. For example, I made my desk hutch and some wall decor for my room last year. Dorms beds have a reputation for being uncomfortable, but it's not impossible to make them just as comfy as your one at home. Honestly, my bed in college was comfier than mine at home; I kind of miss it! All you need is a nice mattress topper and a fluffy duvet, and a few throw pillows and a blanket can do wonders with transforming your bed into a super cute oasis. I also think headboards can really make a difference; here's the DIY tutorial I used to make mine. If you're looking for a new comforter for college, this will probably be your biggest investment and will be the focal point of your room. This is the one I got last year (except mine was navy). Also, there's no reason to be scared of white bedding in college unless you're spill prone! Throw pillows can take your bed from bland to Pinterest worthy in the blink of an eye. I love mixing patterns, colors and shapes with these. I have this one, and I absolutely love how soft and cozy it is! I don't know about y'all, but I always cuddle with a throw blanket when I go to sleep. Although, they also look super cute folded at the end of the bed and really come in handy when you don't want to get under your covers or go to someone else's room. I have this one, and it is super soft and big. Curtains and twinkle lights will instantly make your dorm room feel a million times cozier, and a full length mirror is essential if you want to get a glimpse of your outfit before you leave. Mine actually broke during the first two weeks of school, and I was too lazy to replace it so I struggled with standing on chairs to see my outfit in the vanity mirror which was not ideal! Also, different sized matted frames and DIY canvases are great for making beautiful gallery walls. Finding pieces for my desk was probably one of my favorite parts of decorating. I absolutely LOVE this gold mirror and my bulldog tape dispenser! Also, spray paint can be your best friend if you find something you love just not in the right color; I spray painted this cake stand for my desk. I would also recommend getting a storage ottoman; it was great to have that extra seating and storage. An area rug can also make your room seem a lot more cozier!